Hey, all. I only received my copy of Guillermo del Toro's Cronos today, and so my review isn't ready yet. In the meantime, I want to make sure any readers in Southern California know there is a special release event going on at the Hollywood location of Amoeba Records in conjunction with a screening of the film. Director, writer and producer Guillermo del Toro (Devil's Backbone, Hellboy, Pan's Labyrinth) visits Amoeba to celebrate and sign the release of the Criterion Collection editions of CRONOS, his celebrated feature debut, followed by a special screening of the movie along with his never-before-seen horror short film, Geometria, at the Los Angeles Film School. 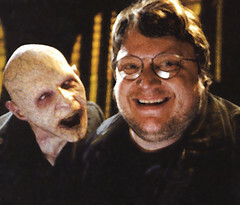 And don't forget to check out Ryan Gallagher's interview with del Toro over at the Criterion Cast to read about what the director is up to. I'm also working on a review of the awesome BBS: America Lost and Found Blu-Ray collection. Expect that and Cronos in the coming week.